The AccuBlue® Broad Range dsDNA Quantitation Solution offers sensitive and selective detection of purified dsDNA samples with minimal effects from common contaminants. The solution provides a linear detection range from 2 – 2000 ng and is compatible with fluorescence microplate readers. This item is a standalone fluorescent DNA quantitation solution, and does not include DNA standards. It is intended for users who wish to use their own DNA standards. 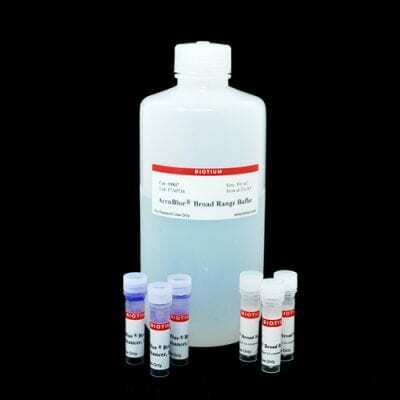 We also sell the complete AccuBlue® Broad Range Quantitation Kit that includes a set of standards (catalog no. 31007). For broad range DNA quantitation using the Qubit® fluorometer from Thermo Fisher, we recommend using our AccuGreen Broad Range dsDNA Quantitation Kit (catalog no. 31069). For high-sensitivity DNA quantitation using a fluorescent plate reader, we recommend using our AccuClear® or AccuBlue® NextGen dsDNA Quantitation Kits, which provide unprecedented sensitivity, accuracy and wide linear range. See the table below for details on our full line of dsDNA quantitation kits.